t was 1976 when a young college graduate boarded the first of the many crowded buses that would transport her from Venezuela to Chile. Although she had originally planned to live in a remote village in the Andes mountains, she ended up living in Chile for six months during the military dictatorship of Augusto Pinochet Ugarte (president 1974–1990). For Margaret Power, it was just the beginning of her love affair with Latin America. Power, now Illinois Tech Department of Humanities chair, may not claim genealogical roots in Latin America, but her passion for its people, politics, and culture is in her blood. Out of these experiences came her first two books, one of which explores the reasons a majority of Chilean women supported the overthrow of Salvador Allende Gossens’s socialist government (1970–73) to make way for Pinochet’s military dictatorship. 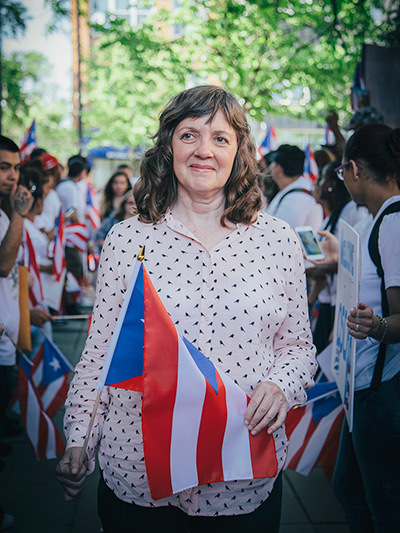 Power continues to immerse herself in research with a more recent focus on Puerto Rico’s Nationalist Party, which led the struggle for the country’s independence from the 1920s to the 1950s. She has worked with Chicago’s Puerto Rican community for many years and serves on the Board of Directors of the Puerto Rican Cultural Center in Humboldt Park. Power was also active in 35 Women for Oscar, a movement that called for the release of political prisoner Oscar López Rivera. López was arrested in 1982 in Chicago and convicted by the United States government on charges of seditious conspiracy for his role in Puerto Rico’s Armed Forces of National Liberation. 35 Women was named for the number of years López was imprisoned. President Barack Obama commuted his sentence in January 2017. At press date Puerto Rican citizens are scheduled to vote on a referendum that offers the options of statehood or independence/free association. “Whatever the outcome of the vote, the point needs to be made that the U.S. Congress will decide the Island’s status, not the Puerto Rican people,” Power says. Power notes that of far greater concern is the country’s current economic crisis. The Island recently declared bankruptcy for the first time in its history. In addition, students at the University of Puerto Rico have declared a strike to protest cuts, and officials from other top universities have resigned in protest. In April Power traveled to Peru to research an upcoming book that will explore why Latin Americans in the ’20s, ’30s, ’40s, and ’50s advocated for Puerto Rico’s independence and reincorporation into Latin America. Part of her research involves the transnational Latin American solidarity movements that supported the Nationalist Party. This will be Power’s sixth book. Her most recent book, Hope in Hard Times: Norvelt and the Struggle for Community During the Great Depression, takes an intimate look at a New Deal community in southwest Pennsylvania named for Eleanor Roosevelt.